The Bailey House was originally built as a parsonage for the ministers of the Wailuku Church. The house is a combination of four structures built between 1835 and 1850. The original portion was built in 1833 by Reverend Jonathan Green and is a two-story lava stone structure measuring approximately 30’ x 20’ with 20” thick walls. A high pitched gable roof is covered with wood shingles. At about the same time (1833), a single story lava stone cookhouse was constructed slightly uphill from the living area. The single room is dominated by a large fireplace and oven flush with the interior wall. The mass of the oven structure projects beyond the north wall. The lower floor is built partially into the side of a hill with the walls retaining the earth on the uphill side. In 1837 a single story lava stone structure with a basement was built for Miss Ogden, a teacher for the girls' school in Wailuku. Edward Bailey was a Protestant missionary from Holden, Massachusetts. Prior to their marriage, Edward attended Amherst College and Caroline was a tailoress. He and his wife Caroline Hubbard Bailey sailed from Boston on the barq, ‘Mary Frazier,’ on December 14, 1836. They arrived in Honolulu April 9, 1837. They were married only two weeks when they left Massachusetts. Caroline was pregnant with son Edward upon their arrival in Hawaii. Not long after their arrival, the couple was transferred to Wailuku to head the Wailuku Female Seminary in 1837. 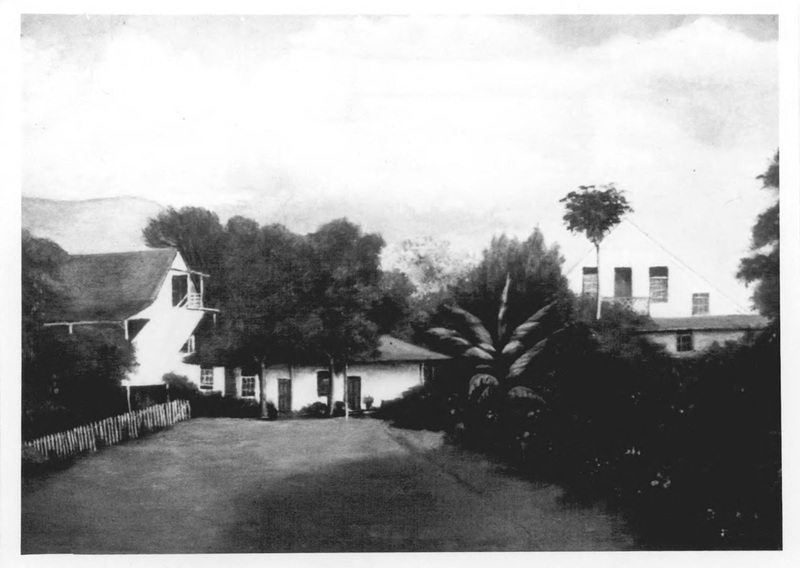 The Seminary was the counterpart to the boy’s institution at Lahainaluna, serving some 50 girls age five to 12. Seminary girls learned the traditional lessons in Hawaiian and were also taught to sew, spin and crochet. They also would work an hour a day in their own garden plots. Bailey worked at the Wailuku Female Seminary in Maui from 1840 until its closure in 1849. At that time he purchased a fee simple title to the Girls' boarding school, the house and lot, and began his interest in what was to become Wailuku Sugar Company. Because of his growing family, Bailey added two rooms upstairs in 1850 and had the entire house re-roofed. After the seminary closed, he built the still-standing Ka'ahumanu Church in Wailuku and operated a small sugar plantation. He designed and built a water powered mill for sugar and wheat in Wailuku. The business developed into the Wailuku Sugar Company. He was also an active participant in starting the Haiku Sugar Company. Over his years in Hawaiʻi, Baily taught music. He aided in the practice of medicine, although he had no medical degree. He created the girls school in Makawao known as Maunaʻolu Seminary. He surveyed native kuleana and built the first bridge over the Wailuku River. He designed the Lahainaluna token currency. He began painting about 1865, at the age of 51, without any formal instruction; he was the most accomplished of the missionary artists in Hawaii. He painted landscapes in oil. Edward and Caroline lived in their Wailuku home for 50-years, then they and their sons (other than Edward Jr. who was married to Emily Kania) moved to California in 1885, possibly 1888. At the time of his death in 1903 Edward Sr. was the oldest living missionary sent to Hawaii between 1820 - 1850 by the American Board of Commissioners for Foreign Missions . The Bailey House is now the Maui Historical Society’s Hale Hō‘ike‘ike (House of Display) showcasing Hawaiian history and culture, as well as paintings and furnishings from nineteenth-century Maui. The image shows the Bailey House; in addition, I had added other images of the property in a folder of like name in the Photos section on my Facebook page.